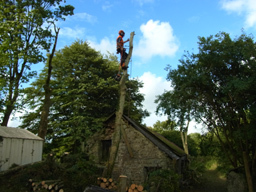 Coming from West Wales and speaking fluent Welsh and English, Paul Toft has been working as a Tree Surgeon since 1986 which was the year he qualified from Merrist Wood College, Surrey. The College is widely recognised by industry specialists for its training and gave Paul an excellent foundation to turn his passion into a long running, successful tree services business. During his time at the college Paul covered all Arboricultural courses including "Advanced Arboricultural Techniques" and to this day he continues to update his professional development and tree surgeon training. Covering Ceredigion, Pembrokeshire, Carmarthenshire and South Glamorgan in both the private and public sector, Paul's objectives are to provide the best arboricultural practice, to be efficient and economical and to always maintain clean completion of work. Consideration to the environment is paramount during the working practice. Paul's work has also taken him to Scotland, Ireland and England. I am aware of current pests and diseases and am affiliated to the Arboricultural Association. I have a strong awareness of the eco system in the area of work and am careful not to disrupt natural surroundings. I work on trees from young species to older veteran trees. Whether felling larger trees or pruning individual or a group of trees the site is always left clean with minimal impact to the surrounding area. I have Public and Products Liability and Employers Liability. We maintain our equipment to ensure that it is in efficient running condition. If you need a tree surgeon, require a free quote or have a general enquiry about tree surgery, please do not hesitate to contact Paul Toft today.